AGILITY PLAYBOOK FOR 2018 – OFFENSE OR DEFENSE? ’Tis the Season to be Jolly … it is also the season for lots of great football action! Hopefully your favorite team will be peaking and performing at this time when it really matters. Our team is the Carolina Panthers who are heading to the playoffs but experiencing some unpredictable VUCA (volatility, uncertainty, complexity and ambiguity) and coming from the most unexpected source … the team owner, Jerry Richardson, A stark reminder that sometimes we face “external” VUCA … and sometimes we face “internal” VUCA that is the result of our own making, neglect or narcissm. In case you hadn’t heard or don’t follow such things … in a matter of a couple of weeks Richardson fell from being revered as one of the high integrity ‘good guys’ stalwart NFL team owners down to a ‘questionable character’ accused of serial ‘workplace misconduct’ … to the point of deciding he must sell the team in 2018. Whew … all in VUCA hyper-speed! Whether your focus is on navigating the chaos of your own internal VUCA or striving for competitive advantage in the commercial world … I do think there are some interesting lessons to be taken from some of the highly successful coach/leaders operating in the cauldron of intense competition called the National Football League (NFL). This is the annual shake-out season – where speculation abounds for who will get fired, hired or retired. In this sport, as in most organizations, there are mindsets, systems and processes for providing offense, defense as well as “special teams”. In this blog space, you often hear us talk about building skills to respond to your VUCA which is a very “defensive” orientation … responding to initiative taken elsewhere. Defense is important. In fact, some say that defense wins championships and well worth building skills and capabilities for “sensing and responding”. As you build your 2018 Agility Playbook, I encourage you to build a “proactive” defensive posture … one that stands ready to map, understand and respond to your environment but also bringing an aggressive mindset for some occasional “blitzes” … forays into the VUCA to test the competition’s capacity to run or pass. Creating Agility as a Competitive Advantage also means building out our “offensive” capabilities … are you ready to seize the day – poised to capture the prize? One of the mindsets and paradigms I fully appreciate and endorse … it is called THE TWO MINUTE DRILL. In American football, this is a hyper-speed and high performance mode that gets initiated at the “last two minutes” of a half or the game end. It is completely amazing and transformative what happens with these teams as they move into this hyper-space. Suddenly, communications become crisp and clear. Roles and responsibility are unambiguous and accountable. Commitment and team effort is superhuman and universal – everyone buys in and delivers. Wow … why isn’t this possible in the first two minutes or mid-way in the first quarter? 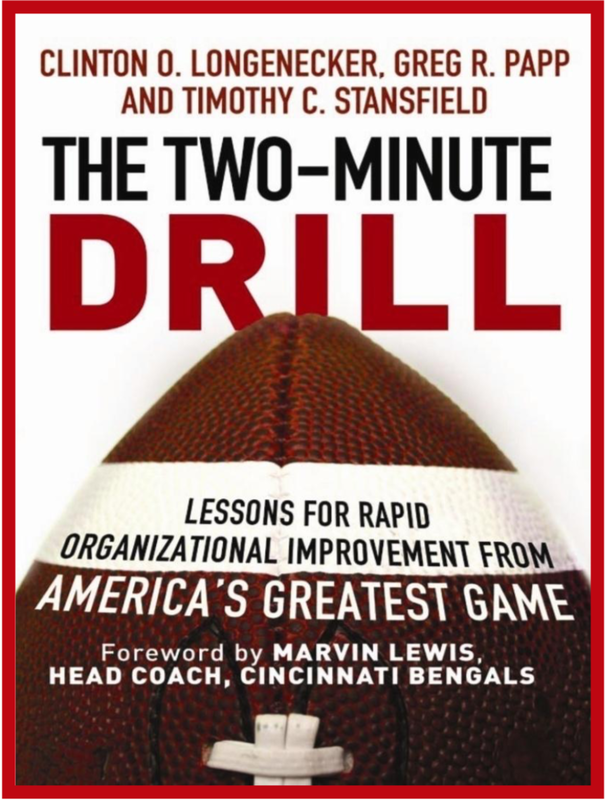 Here is an excerpt I condensed from a great book by Longenecker, Papp and Stansfield called THE TWO MINUTE DRILL. It has some useful thoughts and checklists especially for evaluating your “quarterbacks” (or leaders). How about “special teams” … those amazing specialists who are able to bring focused expertise to things like punts, field goals, kick-offs or creating turnovers. Special teams are very important in agile organizations as well. These special project teams are enabled and empowered to go after chronic agility obstacles and opportunities to bring special solutions or new capabilities to enervate growth and development. More and more, it is clear to us that those organizations that understand, invest and enable mission critical agility action teams … are building the muscle to win in the future. Who knows what challenges 2018 or 2019 will bring … but I know if I have a cadre of skilled agility champions already commissioned, trained and ready … I can face any adversity and have a better chance of succeeding. Those without that foresight … will struggle. All great coaches succeed by building their playbooks and conditioning their teams with the right concepts, capabilities and shared belief systems. How confident are you in your playbook for 2018. Are you ready? This is our specialty area. I would love to explore, refine or build your 2018 Agility Playbook with you. Let me hear your thoughts and ideas!